I love that I'm wrapping up Celiac Awareness month talking about one of my favorite products! 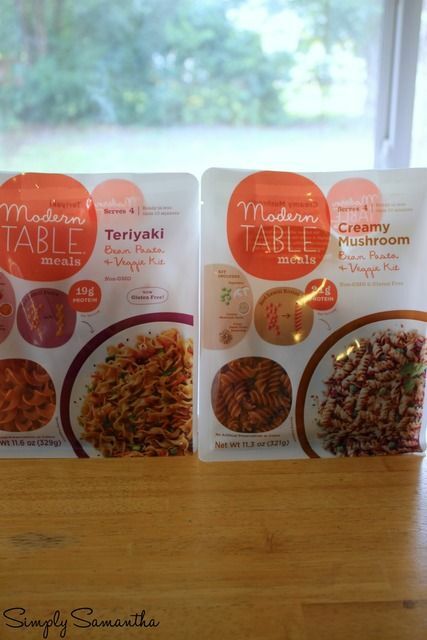 Modern Table Meals is a God send for busy people needing a quick addition to a meal or substitute for dinner! They've also packaged there super tasty Gluten Free lentil based pastas! Now, they've come out with 2 new flavors and 1 oldie but now GLUTEN FREE goodie! And now there original flavor, Teriyaki, is dairy and gluten free! I can't wait to try that one! I love the new meals! Just like their other meals, the flavors are on point! While my husband isn't a fan of mushrooms, I thought the creamy mushroom was amazing! A great side dish to your meal. We had the cheddar broccoli (not pictured because I'm a dodo and forgot to shoot it before opening it ;P) on a busy night and it was a great single meal! Guess what makes these products even better?? You can not only order them online, but you can find them in your local Whole Foods AND Target (pssttt.. target also sometimes runs Cartwheel deals for them). Use their easy store finder here. I can't rave about how much I love these products! They are a great thing to keep in your kitchen cabinet for those busy nights or nights you need a great side dish. *Discloser* Modern Table Meals sent me these products in exchange for a review. Opinions are 100% my own.